Exponential Leadership is a business novel – it follows the journey of a senior leader as he learns that leadership can be considered from an analytical or a quantitative perspective. 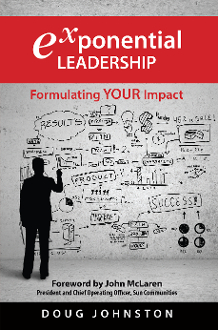 Many senior leaders consider leadership to be something amorphous; here we learn that by gradually building a strong, workable formula we can apply this process to our everyday business lives to generate powerful, impactful results within our organizations. A common theme across all of Doug Johnston’s work is converting the focus of our thinking from short-term results to long-term impact. This book is a heart string in his personal journey to attain such lasting impact for himself and spread the same message to others. An engaging, highly sought-after advisor, keynote speaker, executive think-tank facilitator, and workshop leader, Doug founded his consultancy Impact4Results in 2002. Since that time, he has helped over 10,000 executives, in a variety of industries at all levels, develop the focus they need to achieve lasting impact in their own organizations. Testimonials to his effectiveness rave about his knowledge, expertise and facilitation skills. On the personal front, Doug says he enjoys spring, summer, fall – and endures winter – at his home base near Rochester, New York. He loves cycling and traveling with his family. His wife and two adult children are central to all he does.